I had so many good intentions to get decent photos of this dress before Charlie really started wearing it and potentially staining it. But getting a busy 11 month old to stand or sit still is not happening. First I tried our yard, but she looks like she is in baby jail. 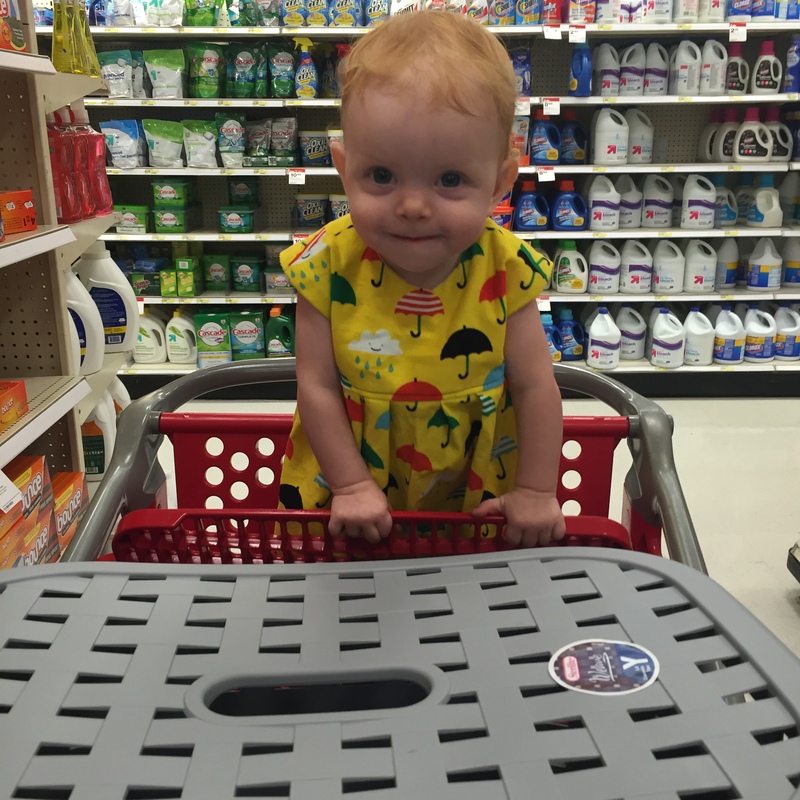 Then we went to Target and the little monkey spent the entire shopping trip trying to stand up and climb out of the cart. See that look on her face? Trouble. Oh yes we have trouble right here in River City, or uh Pasadena. 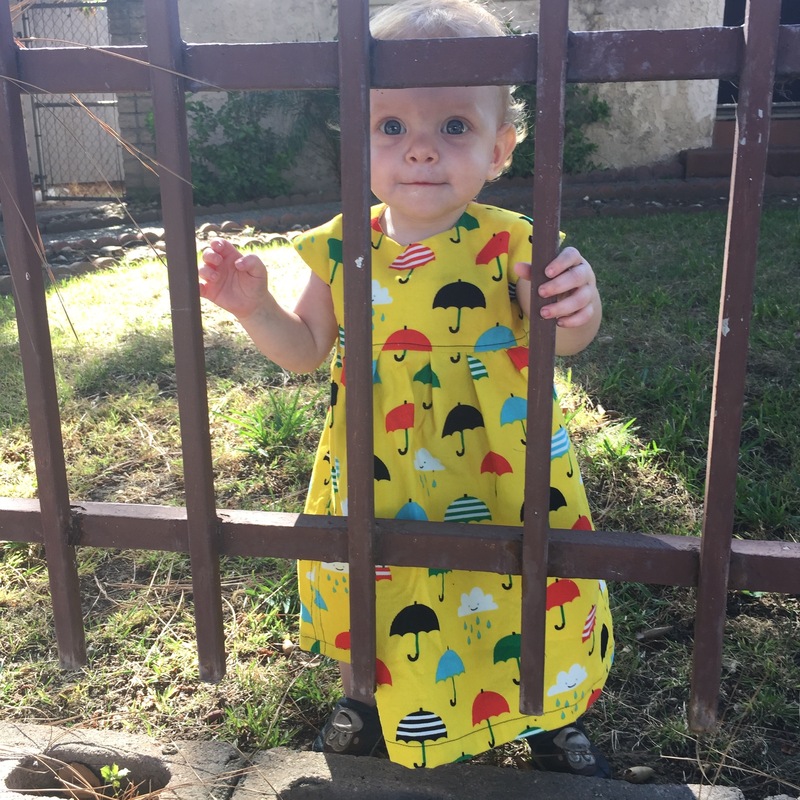 Anyways, I thought I’d have one more chance to get in some good photos before she wore this dress to day care and it ended up covered in formula and dirt and who knows what else. We went apple picking this weekend and I fully admit I had a mental picture that we would suddenly be transported to New England. But of course the orchard was in Southern California and it was a bright and sunny day. The light was much too harsh for photos. Plus the ground was mostly dirt, gravel, and burs. 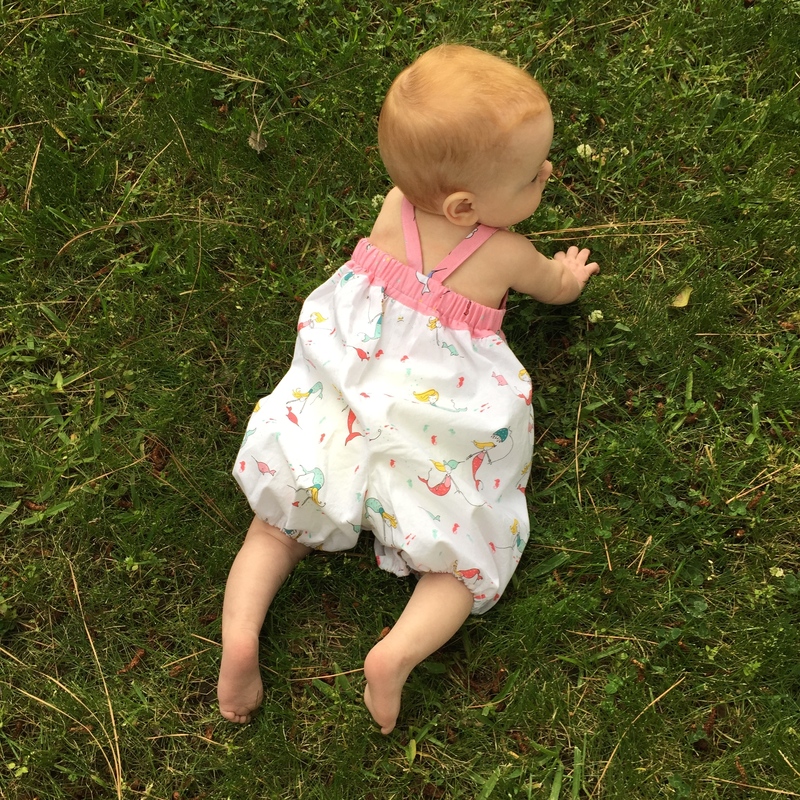 Nothing you’d want your baby to crawl on with no covering for her knees. 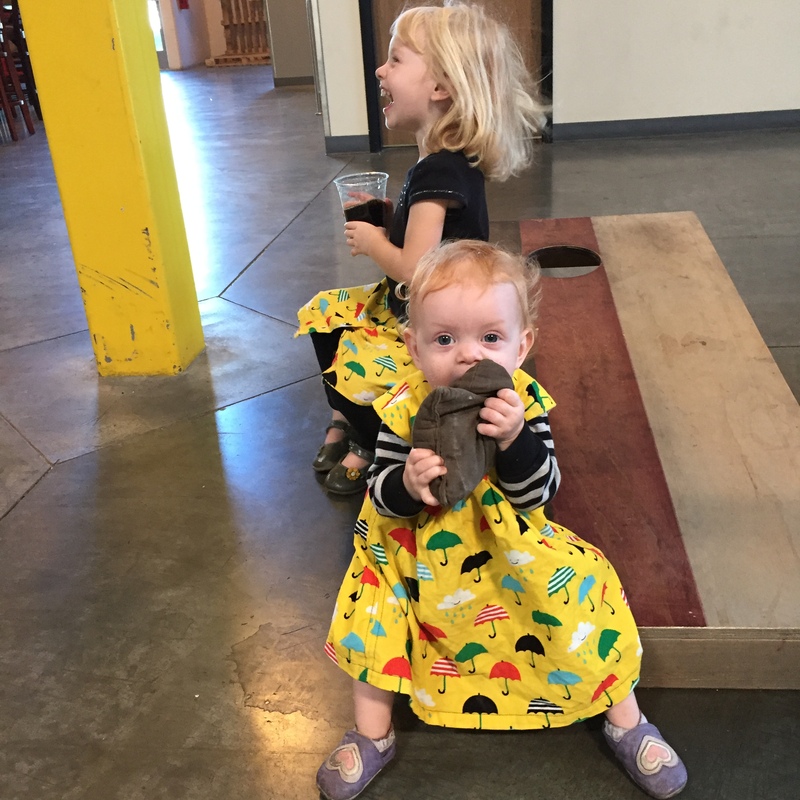 In the end I gave up trying to get the perfect photo of our baby in her dress and sure enough I got a few cute photos…when we stopped by a brewery on our way home. Figures. Look at those sisters in their matching outfits. 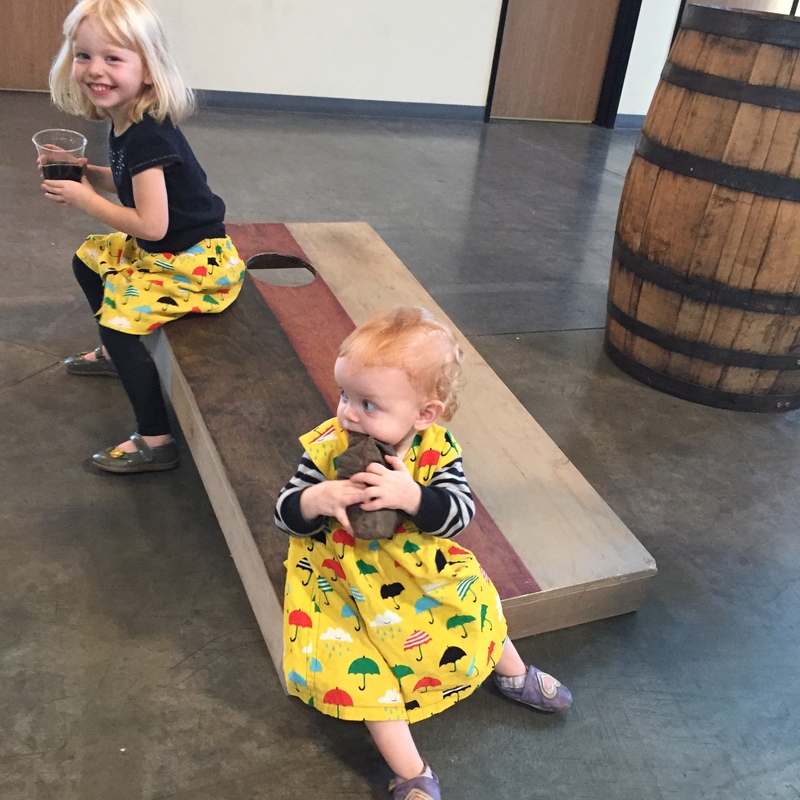 Warms this momma’s heart to see her girls in coordinating homemade outfits. A lady stopped me at Target to compliment me and it was such a great moment when she asked if I’d made their outfits. Probably something she doesn’t see a lot, but used to be such a standard part of childhood. I love being about to make them such nice things to wear. I’m calling this Charlie’s rain dance jumper because I keep hoping if I make her more corduroy dresses we’ll get the El Nino rain that’s been promised. At least my girls are ready for it if you considering wearing umbrellas to count as preparedness! 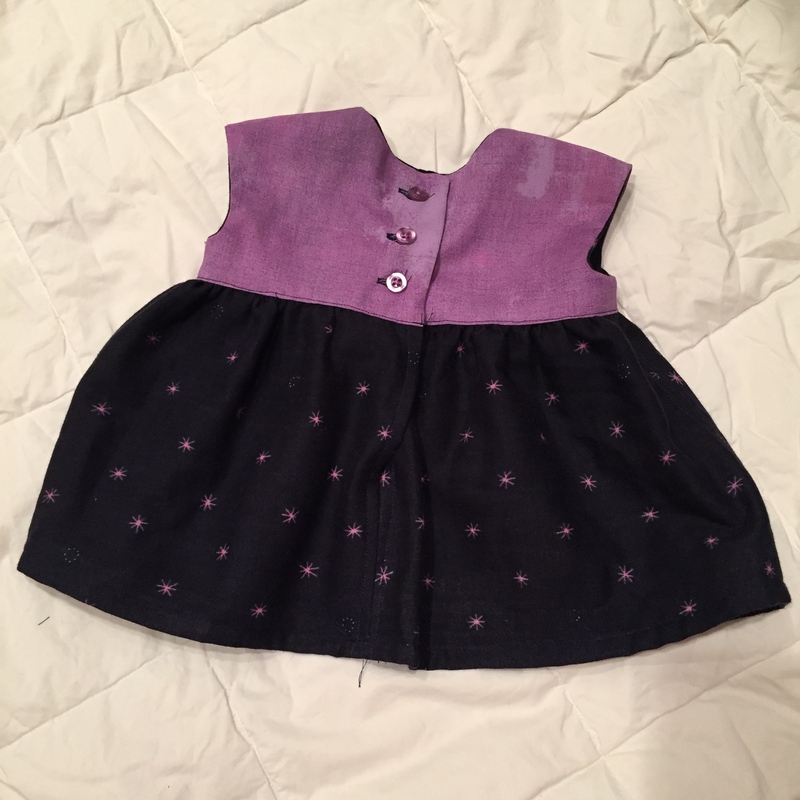 The dress is sewn with Small World Fabric from Rae Hoekstra. I bought a couple yards of 3 different prints specifically to make clothes for this winter. 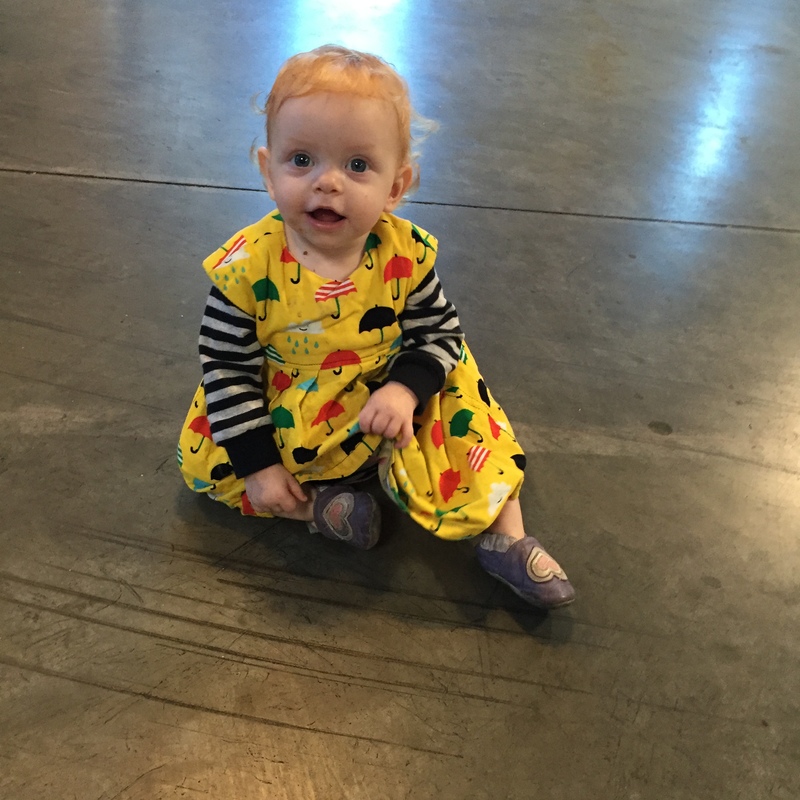 Making a toddler skirt and an infant dress has exhausted this print. 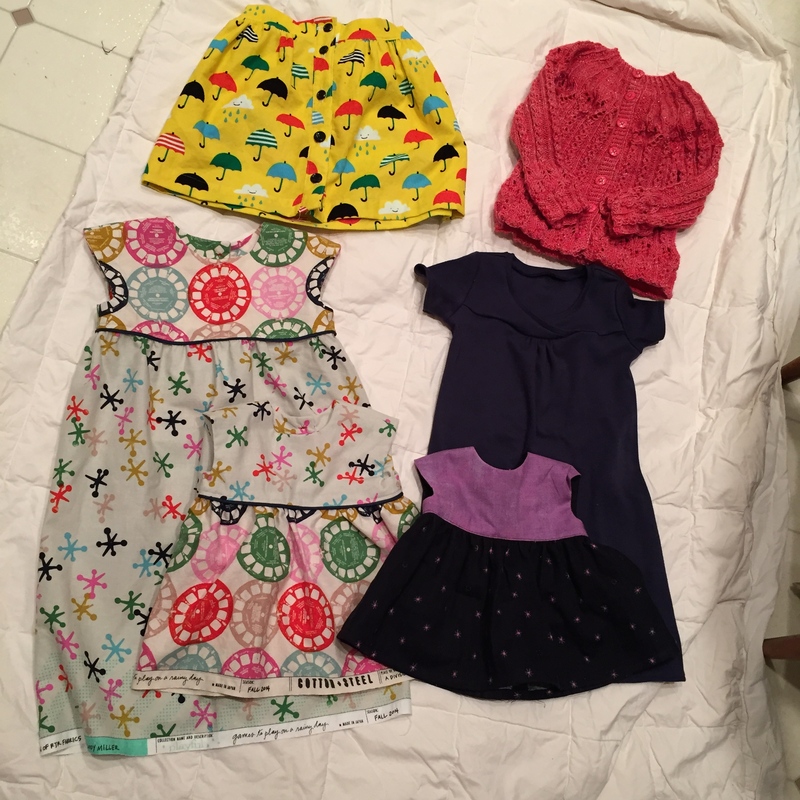 Lu doesn’t really need more clothes since she wears uniforms 4 days a week, but Charlie’s supply dwindled once I cleared out all the 6 month sized clothes. So I’m sure most of the other 2 remaining prints will be used for baby clothes first. 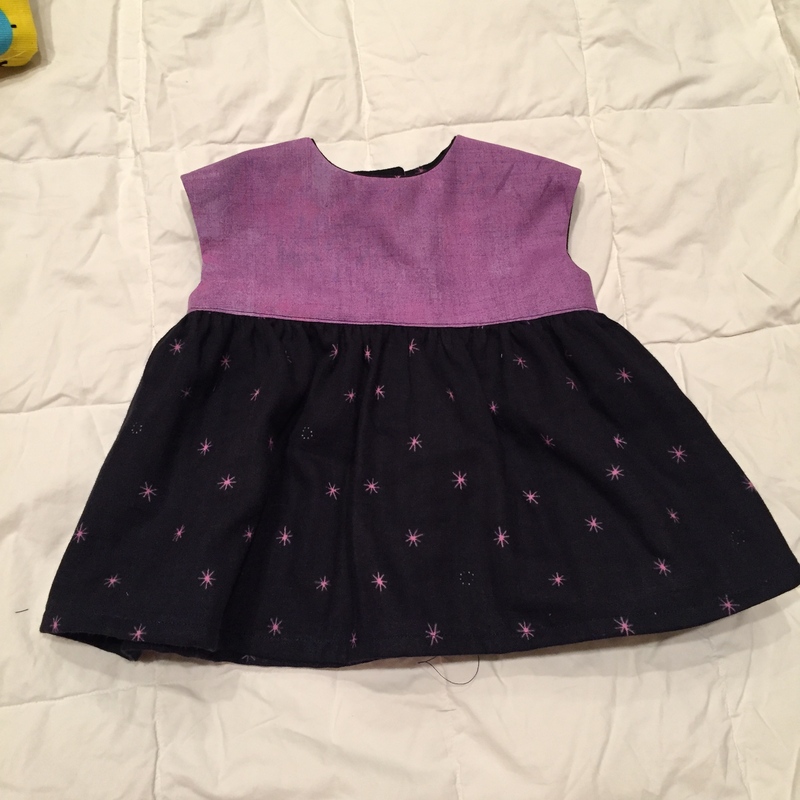 The pattern is Geranium Dress which is easily my go-to pattern for kid dresses. 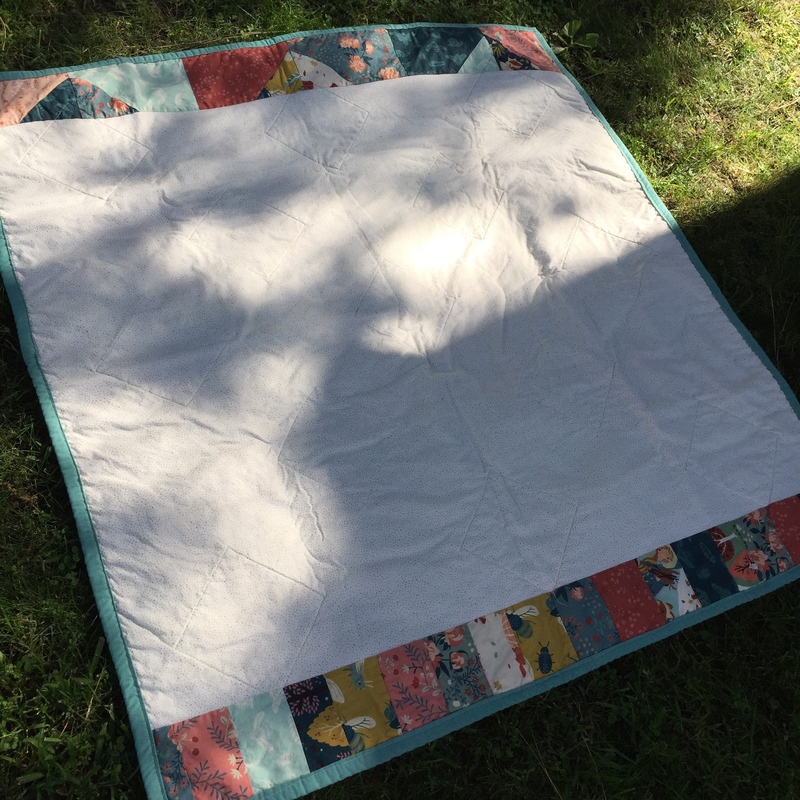 Simple, quick to sew, lots of options to customize it. You’ll be seeing many more of these in the near future. In other sewing news, not a ton is happening right now. I’m knitting away on a sweater for my husband and that take the majority of my crafting time. 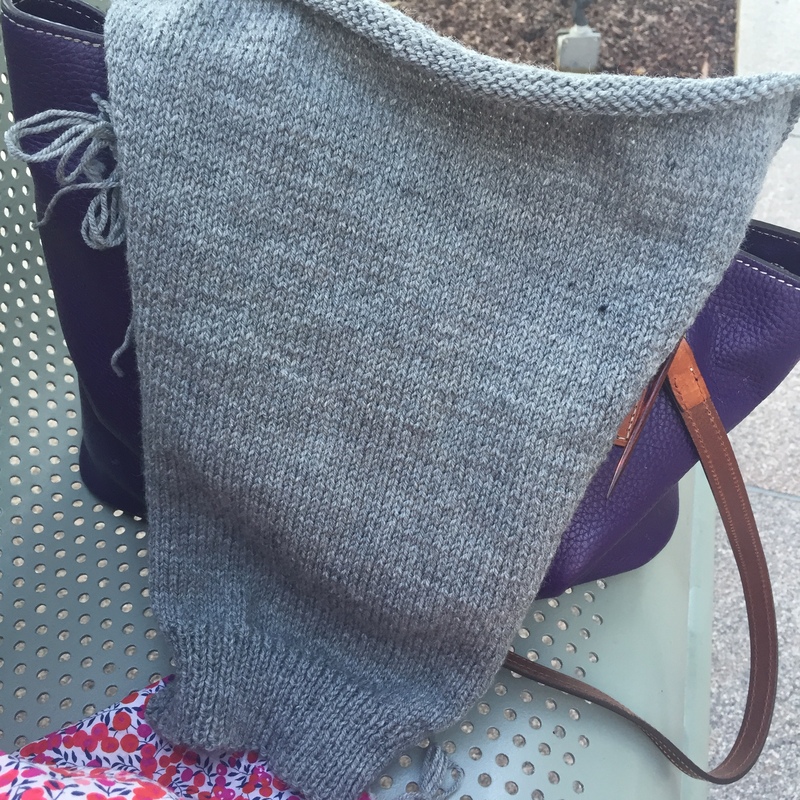 If you follow me on Instagram you’ve probably seen a lot of boring grey knitting posts like this one. A sleeve! When I’m not knitting I’m working on Halloween costumes and my first (I think ever) plaid dress. Hope to have something else to share with you soon! So many plans, so little time. 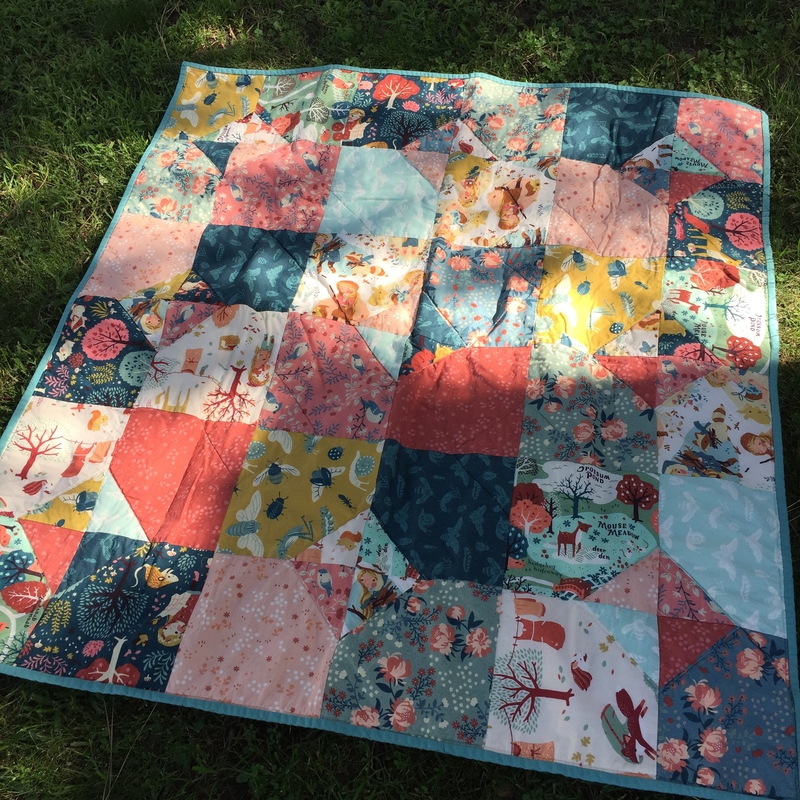 A few weeks ago a friend of mine came over for Jessica’s Sewing Boot Camp. Truth is she did not need my help. She only lacked the confidence she needed to start whipping out endless outfits. (And she’s made a ton of stuff in the last 3 weeks!) But the high light of my day was making this romper. Oh my word. Was this really 3 weeks ago? Indeed it was. 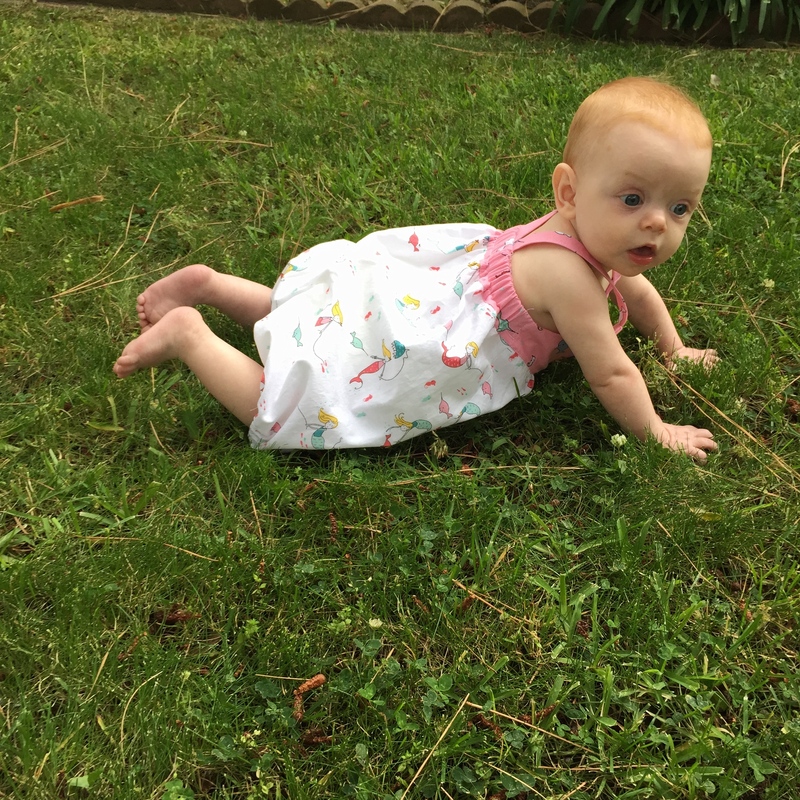 Baby is very nearly crawling now. 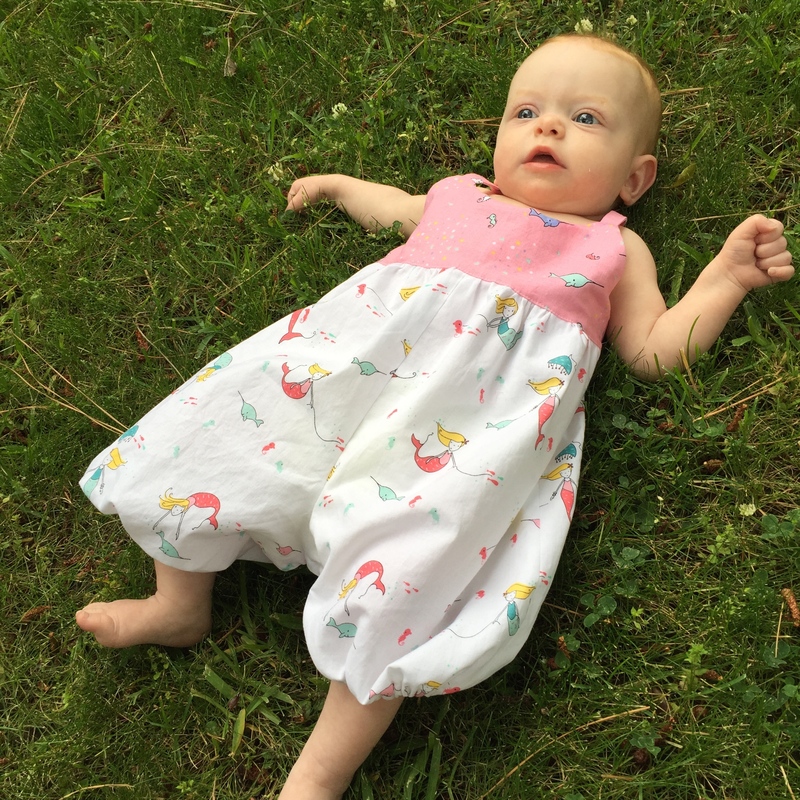 The pattern is the Hummingbird Romper from Rabbit Rabbit Creation. Tiny baby is tiny and even at 7 months old she is swimming in the 6 month size. But it should also fit her well in the heat that will be descending on Southern California any day now. 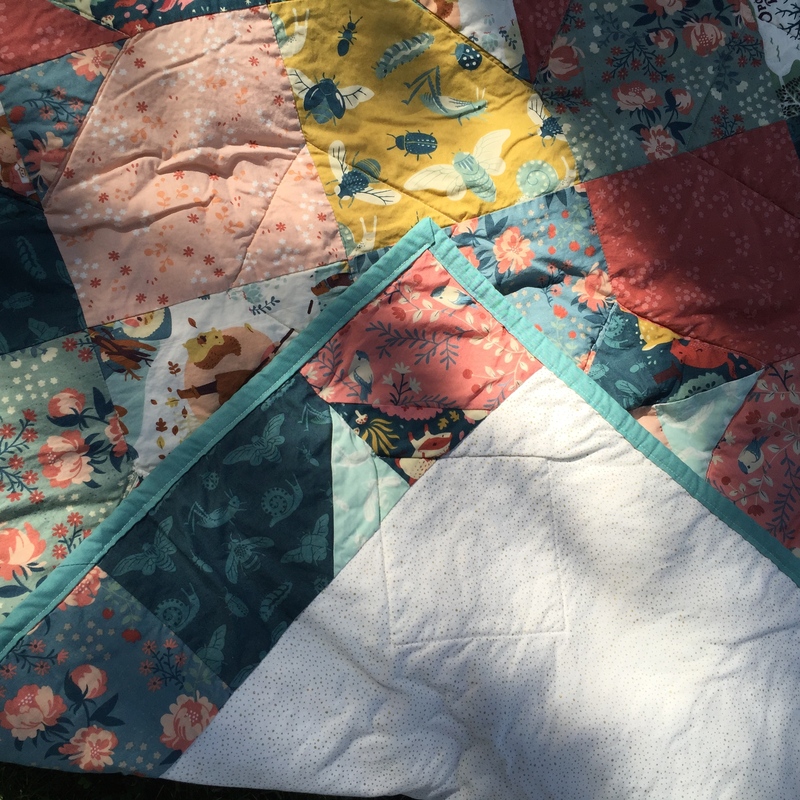 The pattern was a snap to put together. 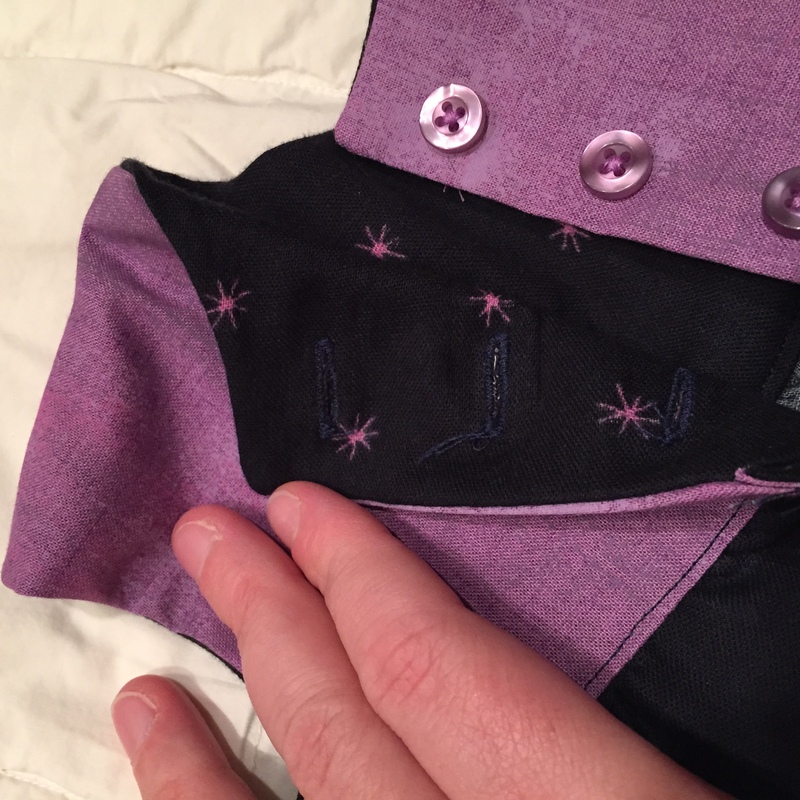 The hardest part was trying to attach the pants along the narrow strip at the back below the elastic. 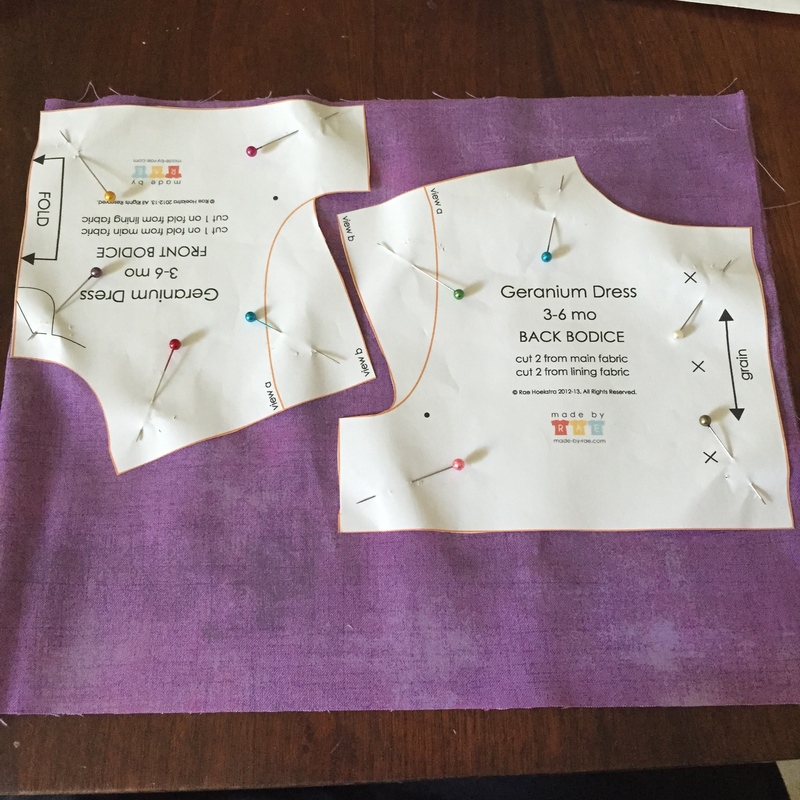 That is probably easier on the larger sizes, but a tiny bit tricky on the smaller sizes. 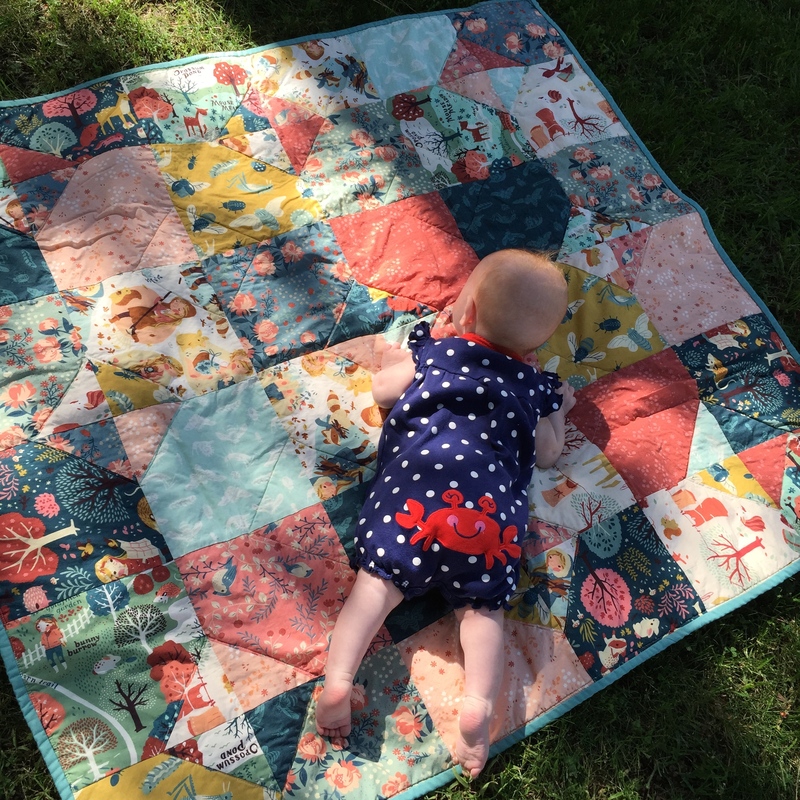 The fabric is from the ridiculously cute Saltwater from Riley Blake Designs. These are my two favorite prints from the collection and I bought just enough to make a little something for the Charlie. I should have bought more. 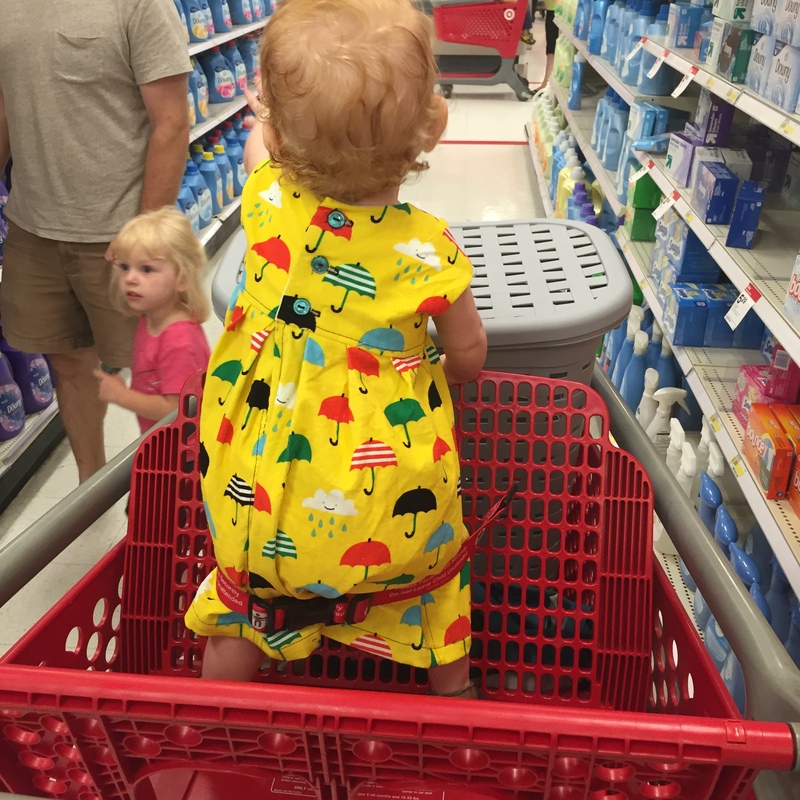 As for the romper pattern, I see more of those in her future. 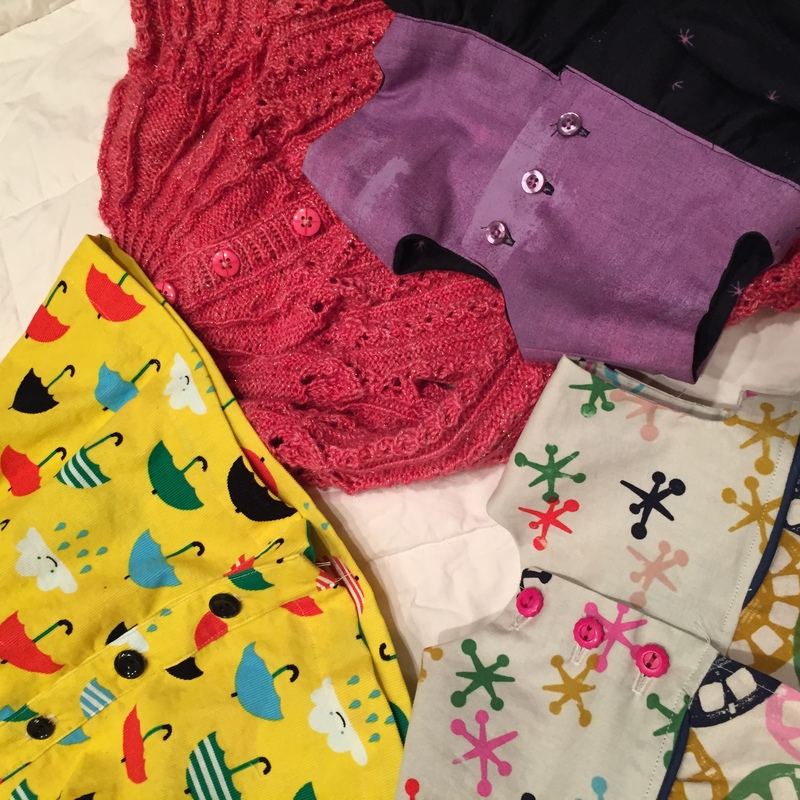 I have 1 yard each of the Hilltop line from Dear Stella and I think a romper would be a fun use of a couple of those fabrics.